Many of us used to love the 1995 PC classic game, Worms. A while back, Team17 released Worms and Worms 2: Armageddon on the iPhone and iPad, and our reviewer loved it. Now, Team17 has released a new app, Worms Crazy Golf. 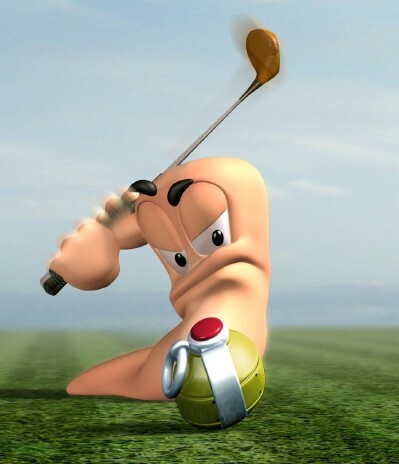 The golf variation of the game involves the same physics as the other games in the Worms series and still promises the same explosive action. The aim of the game is to get the ball in the hole with as many points as possible; which you earn by putting the ball into the hole in as few shots as possible. But beware because those little guys cutting the grass blow up when hit, leaving your ball in the sand. The app contains all the usual Worms nonsense that is so much fun. The iPhone app is $2.99, and for that price you will get the following: three 18 hole courses, 15 challenges with leaderboard support, four player multi-player and character customization. The application also includes Retina display support, multi-tasking and the option to switch to lower quality graphics if your older generation device is having frame rate issues. This app is definitely worth �the price tag, after all, you can�t put a price on endless fun, can you? If you have ever played the previous Worms games, I�m sure you�ll love this one too. You can find Worms Crazy Golf for iPhone in the App Store for $2.99, and the iPad version for $4.99.